The HHM-380395 meter provides four insulation resistance test ranges plus continuity, AC/ DC voltage, polarization index and dielectric absorption ratio measurements. 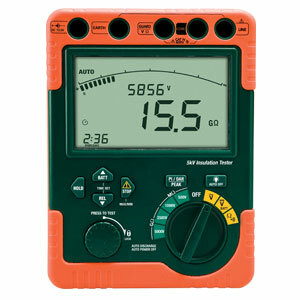 This meter is shipped fully tested and calibrated, with proper care and use, will provide years of reliable service. Note: Comes complete with test leads, 8 C batteries, AC adaptor, and heavy-duty carrying case and operator’s manual.